– When it comes to tech innovation there’s just about nothing more impressive than thermal vision. This is the ideal device for the outdoorsman or hunter in your family. 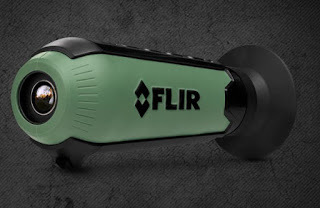 This pocket-sized thermal vision monocular lets anyone to see in total darkness. You can take video and photos capturing the heat signatures of people and animals up to 100 yards away. Common uses include spotting wildlife in zero or low-light conditions, including fog and making sure the campfire is really extinguished.